[S2] GRO Indexes to Births. "GRO Online Index: 1839/Q4 PASK, Thomas PYCH Lincoln 14 453." [S151] The Church of the Jesus Christ of Latter-Day Saints, Vital Records Index, Second Edition: FHL Film 989855 Bardney: 1697 - 1876. [S2] GRO Indexes to Births. "1839/Q4 PASK, Thomas Lincoln 14 453." [S27] Website National Burial Index (NBI) @ FindMyPast (www.findmypast.co.uk: ) 28 Jan 1840 Thomas PASK inf Lincolnshire Bardney, St Lawrence. [S4] GRO Indexes to Deaths. "1840/Q2 PASK, Thomas Lincoln 14 321." [S870] E-mail from Chris Bell to Stuart & Teresa Pask dated 13 February 2005. Research Note: Family not located in the 1901 census. [S3465] Image of the 1871 Census for 12 Apsley Crescent, Manningham, Yorkshire: RG10 Piece 4484 Folio 65 Page 32. [S1721] Image of the 1851 for Bardney, Lincolnshire: HO107 Piece 2104 Folio 401 Page 34. [S1068] Image of the 1881 Census for Lincoln, Lincolnshire: RG11 Piece 3239 Folio 41 Page 75. [S1067] E-mail from Jyakin to Stuart & Teresa Pask dated 9 February 2005. [S3] GRO Indexes to Marriages. "1881/Q4 PASK, Betsy Ann Lincoln 7a 1021." [S1069] Image of the 1891 Census for Lincoln, Lincolnshire: RG12 Piece 2590 Folio 47 Page 3. [S2] GRO Indexes to Births. "1881/Q2 PASK, Elizabeth Lincoln 7a 494." [S1729] Image of the 1901 Census for Campney Lane, Bucknall, Lincolnshire: RG13 Piece 3068 Folio 63 Page 7. [S3] GRO Indexes to Marriages. "1903/Q2 PASK, Samuel Lincoln 7a 1259." [S3363] Transcript of the marriage of Samuel Pask and Sarah Ann Addlesee, 3 June 1903. Kindly provided by Mick Hopkins - GOONS Marriage Challenge. [S2] GRO Indexes to Births. "1887/Q3 PASK, James Horncastle 7a 654." [S4946] Image of the 1911 Census for Bucknall, Lincolnshire: 1911 RG14 Piece 19787 Schedule 30. [S3] GRO Indexes to Marriages. "1911/Q3 PASK, James = EAST, Beatrice M. Horncastle 7a 1215." Indexing Project (Batch) Number: M02730-3 , System Origin: England-ODM , GS Film number: 1541958 IT 4. [S4947] E-mail from Ann Pepper to Stuart & Teresa Pask dated 8 November 2014: Beatrice Mary Pask lived SouthreyBuried 7th Dec 1914Aged 28. [S4] GRO Indexes to Deaths. "1914/Q4 PASK, Beatrice M. Lincoln 7a 541 age 28." [S4947] E-mail from Ann Pepper to Stuart & Teresa Pask dated 8 November 2014: Beatrice Mary Pask lived Southrey Buried 7th Dec 1914Aged 28. [S3] GRO Indexes to Marriages. "1923/Q4 PASK, James = TOWNELL, Ethel E. Horncastle 7a 1273." [S4] GRO Indexes to Deaths. "1932/Q1 PASK, Ethel E. Lincoln 7a 728 age 44." [S4947] E-mail from Ann Pepper to Stuart & Teresa Pask dated 8 November 2014: Ethel Eliza Pask Campney Lane Bucknall Buried16th Feb 1932 Aged 43. [S3] GRO Indexes to Marriages. "1934/Q3 PASK, James = DAVIDSON, Annie E. Horncastle 7a 1676." [S4] GRO Indexes to Deaths. "1955/Q4 PASK, James Lincoln 3b 249 age 68." [S4947] E-mail from Ann Pepper to Stuart & Teresa Pask dated 8 November 2014: Annie Elizabeth Pask Southrey Buried 8th Nov 1965 Aged 86. [S4] GRO Indexes to Deaths. "1965/Q4 PASK, Annie E. Welton 3b 455 age 86." [S2] GRO Indexes to Births. "1912/Q1 PASK, Herbert EAST Horncastle 7a 986." [S2] GRO Indexes to Births. "1928/Q3 PASK, Margaret TOWNELL Lincoln 7a 770." [S192] 1881 Census for Bardney, Lincolnshire. Full details upon request: FHL Film 1341771 PRO Ref RG11 Piece 3237 Folio 22 Page 39. [S1092] Image of the 1861 Census for Southrey, Bardney, Lincolnshire: RG9 Piece 2356 Folio 15 Page 24 from Archive CD Books. [S1088] Image of the 1841 Census for Southrey, Bardney, Lincolnshire: HO107 Piece 627 Book 1 Folio 7 from Archive CD Books. [S873] Image of the 1871 Census for Southrey, Lincolnshire: RG10 Piece 3367 Folio 33 Page 22. [S4] GRO Indexes to Deaths. "1884/Q3 PASK, John Lincoln 7a 352 age 69." [S4] GRO Indexes to Deaths. "1885/Q1 PASK, Elizabeth Lincoln 7a 327 age 63." [S4999] Website UK Government Probate Search Service: Administration of the Personal Estate of Elizabeth Pask late of Southrey in the County of Lincoln Widow who died 10 March 1885 at Southrey was granted at Lincoln to Richard Pask of the City of Lincoln Tailor the Son and one of the Next of Kin. [S27] Website National Burial Index (NBI) @ FindMyPast (www.findmypast.co.uk: ) 13 Mar 1885 Elizabeth PASK 63 Lincolnshire Bardney, St Lawrence. [S2] GRO Indexes to Births. "GRO Online Index: 1841/Q2 PASK, Male PYCH Lincoln 14 452." [S2] GRO Indexes to Births. "GRO Online Index: 1845/Q1 PASK, John PYCHE Lincoln 14 508." [S2] GRO Indexes to Births. "GRO Online Index: 1851/Q1 PASK, Jane PYCHE Lincoln 14 332." [S2] GRO Indexes to Births. "GRO Online Index: 1853/Q3 PASK, Eliza PYCHE Lincoln 7a 405." [S2] GRO Indexes to Births. "GRO Online Index: 1859/Q4 PASK, Thomas PYCHE Lincoln 7a 418." [S1728] Image of the 1881 Census for Bardney, Lincolnshire: RG11 Piece 3237 Folio 21 Page 38. [S1733] Image of the 1901 Census for Southrey, Bardney, Lincolnshire: RG13 Piece 3058 Folio 72 Page 31. [S3] GRO Indexes to Marriages. "1870/Q3 PASK, James Lincoln 7a 737." [S3385] Transcript of the marriage of James Pask and Hannah Carr, 19 July 1870. Kindly provided by Marion Harper Hopkins - GOONS Marriage Challenge. [S3] GRO Indexes to Marriages. "1870/Q3 CARR, Hannah Lincoln 7a 737." [S1734] Image of the 1871 Census for Southrey, Lincolnshire: RG10 Piece 3367 Folio 35 Page 25. [S4949] Image of the 1911 Census for Lowthorpe Southrey Lincoln, Bardney, Lincolnshire: RG14 Piece 19698 Schedule 7. [S4] GRO Indexes to Deaths. "1925/Q4 PASK, James Lincoln 7a 547 age 82." [S4] GRO Indexes to Deaths. "1929/Q3 PASK, Hannah Lincoln 7a 458 age 80." [S4947] E-mail from Ann Pepper to Stuart & Teresa Pask dated 8 November 2014: Hannah Pask lived Southrey Buried 19th July 1929 Aged 81. [S4947] E-mail from Ann Pepper to Stuart & Teresa Pask dated 10 November 2014: No plot number noted. [S1728] Image of the 1881 Census for Bardney, Lincolnshire: RG11 Piece 3237 Folio 21 Page 38 ". Wife was a widower." [S3375] Transcript of the marriage of John Buttery and Elizabeth Pask, 31 May 1860. Kindly provided by Susan Atkins - GOONS Marriage Challenge. [S3] GRO Indexes to Marriages. "1860/Q2 BUTREY, John Lincoln 7a 883." [S3] GRO Indexes to Marriages. "1860/Q2 PESK, Elizabeth Lincoln 7a 883." In the census of 31 March 1901 George was listed as the Head of Household; a Farm Labourer, living with his wife. [S2435] Image of the 1881 Census for Blankney, Lincolnshire: RG11 Piece 3221 Folio 63 Page 15. [S5551] Image of the 1911 Census : RG14PN19613 RG78PN1177 RD416 SD1 ED10 SN42. [S314] Parish Registers Transcript, Timberland, Lincolnshire "Baptism: Edward PASK s John & Susanna otp labourer." [S2462] Copy of the marriage certificate of Edward Pask and Eliza Bradshaw, 15 May 1862. Kindly provided by Fred L. Taylor. Baptised 21 September 1834 St. Andrew's Church Timberland. [S3337] Image of the 1841 Census for Timberland, Lincolnshire: HO107 Piece 0623 Book 9 Folio 5-6. Indexed incorrectly under the name of PARK. [S5545] Image of the 1851 Census : HO107 Piece 2101 Folio 142 Page 20. [S2448] Image of the 1861 Census for Blankney, Lincolnshire: RG9 Piece 2341 Folio 55 Page 12. [S2438] E-mail from Fred L. Taylor to Stuart & Teresa Pask dated 12 January 2007. [S3] GRO Indexes to Marriages. "1862/Q2 PASK, Edward = BRADSHAW, Elizabeth Sleaford 7a 663." Married 15 May 1862 Edward Park [Pask] = Eliza Bradshaw. 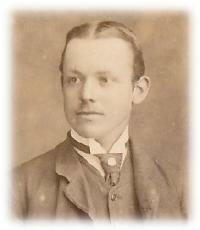 [S2532] Scanned photograph of Edward Pask. Kindly provided by Fred L. Taylor. [S2436] Image of the 1871 Census for Blankney, Lincolnshire: RG10 Piece 3347 Folio 76 Page 15. [S2437] Image of the 1891 Census for Blankney, Lincolnshire: RG12 Piece 2577 Folio 53 Page 17. [S2232] Image of the 1901 Census for Blankney Fen, Blankney, Lincolnshire: RG13 Piece 3047 Folio 111 Page 20. [S4] GRO Indexes to Deaths. "1913/Q3 PASK, Eliza Sleaford 7a 445 age 74." [S4] GRO Indexes to Deaths. "1919/Q4 PASK, Edward Sleaford 7a 463 age 85." [S3362] Transcript of the marriage of Edward Pask and Fannie Marie Ardron, 26 December 1901. Kindly provided by Mick Hopkins - GOONS Marriage Challenge. [S2] GRO Indexes to Births. "GRO Online Index: 1878/Q3 PASK, Lizzie BRADSHAW Sleaford 7a 463." [S2438] E-mail from Fred L. Taylor to Stuart & Teresa Pask dated 5 December 2006. [S2438] E-mail from Fred L. Taylor to Stuart & Teresa Pask dated 12 January 2007: "She is listed in parish records ref. 18 19 005 02A page 90 No. 716 as ELIZA BRADSHAW born 23rd Dec 1837 to Joseph (labourer) and Jane Bradshaw of Metheringham. She had a sister called Elizabeth who was born 3 yrs. earlier." [S2531] Scanned photograph of Eliza Pask née Bradshaw holding a child. Kindly provided by Fred L. Taylor. [S2541] Scanned photograph of Eliza Pask in front of the Labourers Cottage in Blankney. Kindly provided by Fred L. Taylor. [S2542] Scanned photograph of Labourers Cottage in Blankney 2000. Kindly provided by Fred L. Taylor. Research Note: Her birth was not found in GRO Birth Registration. There is a birth in 1867/Q4 in Gainsborough, but this is a different family. 6 October 1867, Eliza Hannah daughter of Edward & Eliza Pask of Blankney, a Labourer. [S3] GRO Indexes to Marriages. "1888/Q4 PASKE, Hannah = ROSSINGTON, Henry Sleaford 7a 809." 6 October 1867, Eliza Hannah daughter of Edward & Eliza Park [Pask] of Blankney, a Labourer. [S3664] Image of the 1891 Census for Blankney Village, Lincolnshire: RG12 Piece 2577 Folio 45 Page 1. [S3663] Image of the 1901 Census for Village Street, Blankney, Lincolnshire: RG13 Piece 3047 Folio 104 Page 6. [S3662] Image of the 1911 Census for Blankney, Lincolnshire: RG14 Piece 19612 Schedule 32. [S3661] E-mail from Richard Rossington to Stuart & Teresa Pask dated 13 February 2010. [S8] Website Commonwealth War Graves Commission (http://www.cwgc.org) : ROSSINGTON, EDWARD THOMAS Initials: E T Nationality: United Kingdom Rank: Private Regiment/Service: Sherwood Foresters (Notts and Derby Regiment) Unit Text: 2nd Bn. Age: 25 Date of Death: 13/06/1917 Service No: 35824 Additional information: Son of Henry and Hannah Rossington, of Blankney, Lincoln. Casualty Type: Commonwealth War Dead Grave/Memorial Reference: I. R. 25. Cemetery: PHILOSOPHE BRITISH CEMETERY, MAZINGARBE. [S8] Website Commonwealth War Graves Commission (http://www.cwgc.org) : ROSSINGTON, WILLIAM HENRY Initials: W H Nationality: United Kingdom Rank: Private Regiment/Service: Lincolnshire Regiment Unit Text: 4th Bn. Age: 21 Date of Death: 15/04/1918 Service No: 202072 Additional information: Son of Henry and Hannah Rossington, of Blankney, Lincoln. Casualty Type: Commonwealth War Dead Grave/Memorial Reference: Panel 3. Memorial: PLOEGSTEERT MEMORIAL. [S2534] Scanned photograph of Hannah Pask. Kindly provided by Fred L. Taylor. [S4999] Website UK Government Probate Search Service: TANTON Harriet Anne of Bailbrook House Batheaston Bath widow died 10 July 1934 Administration London 2 August to Hannah Rossington (wife of Henry Rossington). Effects £1165 11s. 1d. [S4] GRO Indexes to Deaths. "1940/Q2 ROSSINGTON, Henry Sleaford 7a 1053 age 76." [S4] GRO Indexes to Deaths. "1952/Q1 ROSSINGTON, Hannah Sleaford 3b 126 age 84." [S4999] Website UK Government Probate Search Service: ROSSINGTON Hannah of Blankney Lincolnshire widow died 5 February 1952 Probate London 8 March to Eliza Connell (wife of Thomas Connell). Effects £233 16s. 5d. [S3661] E-mail from Richard Rossington to Stuart & Teresa Pask dated 25 August 2015. Research Note: Unable to ascertain two of the three children who died. Also the third child (not included in 1911 census). There were two BROWN boys who were born, and died in infancy in Grantham - William Edward, and Joseph Eddie BROWN. However no baptism record found for them in Great Ponton. [S2] GRO Indexes to Births. "1870/Q2 PASK, Mary Jane Sleaford 7a 421." Bp 1 May 1870, Mary Jane daughter of Edward & Eliza Park [Pask] of Blankney, a Labourer. 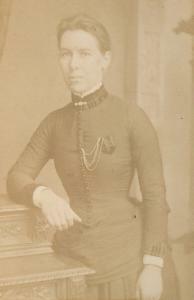 [S2535] Scanned photograph of Mary Jane Pask. Kindly provided by Fred L. Taylor. [S3] GRO Indexes to Marriages. "1898/Q1 PASK, Mary Jane = BROWN, Arthur Grantham 7a 633." 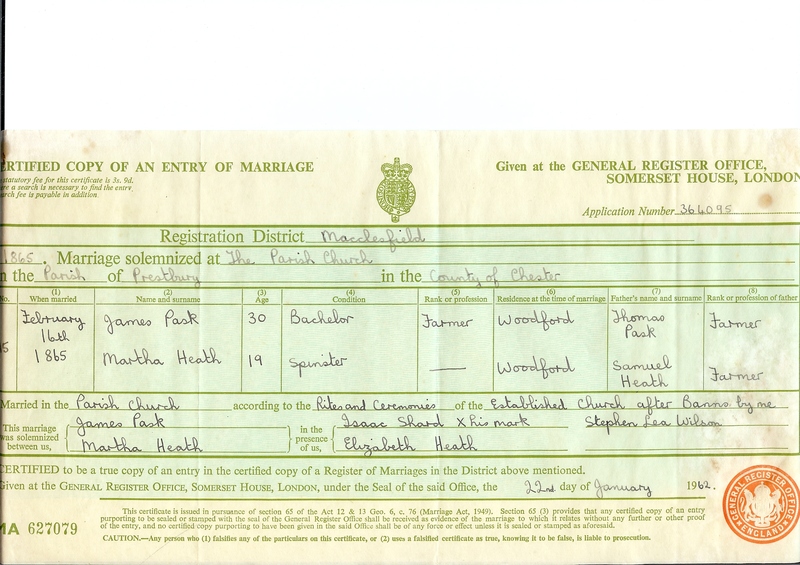 [S285] Website FamilySearch Internet (http://www.familysearch.org) : England Marriages, 1538–1973 ," database, FamilySearch (https://familysearch.org/ark:/61903/1:1:NVJN-4D9 : accessed 20 August 2015), Arthur Brown and Mary Jane Park, 17 Jan 1898; citing Great Ponton, Lincoln, England, reference ; FHL microfilm 1450484 IT 2. [S5550] Image of the 1901 Census : Piece 3052 Folio 142 Page 1. [S5551] Image of the 1911 Census : RG14PN19379 RG78PN1155 RD409 SD1 ED7 SN87. [S4] GRO Indexes to Deaths. 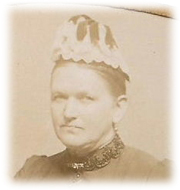 "1924/Q1 BROWN, Mary J. Oakham 7a 445 aged 56." 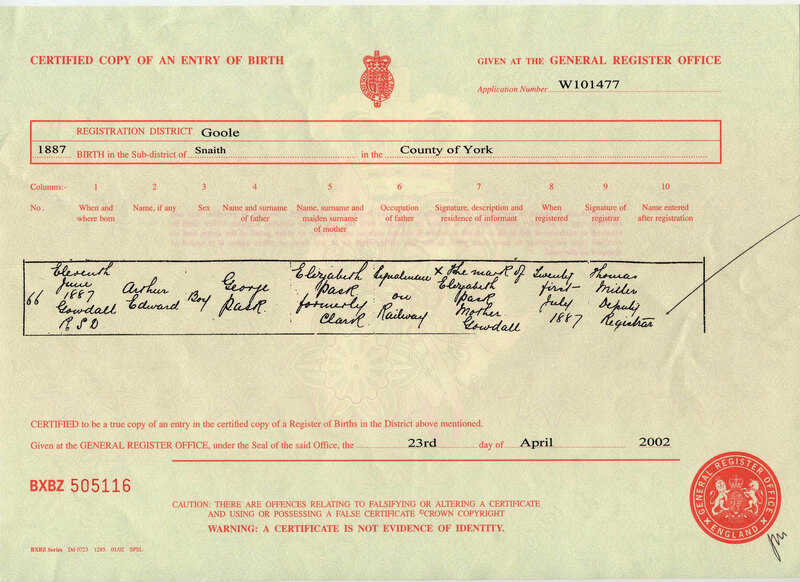 [S285] Website FamilySearch Internet (http://www.familysearch.org) : England Births and Christenings, 1538-1975," database, FamilySearch (https://familysearch.org/ark:/61903/1:1:N66M-V4M : accessed 20 August 2015), Eliza Brown, 04 Sep 1898; citing Great Ponton, Lincoln, England, reference item 2 p 62; FHL microfilm 1,450,484. [S2] GRO Indexes to Births. "1900/Q3 BROWN, Ivy May Grantham 7a 473." [S2] GRO Indexes to Births. "RG14PN19379 RG78PN1155 RD409 SD1 ED7 SN87." [S2] GRO Indexes to Births. "1903/Q4 BROWN, Annie Elizabeth Oakham 7a 334." [S2] GRO Indexes to Births. "1874/Q2 PASK, Susannah Sleaford 7a 446." 5 July 1874, Susannah daughter of Edward & Eliza Paske of Blankney, a Labourer. [S2537] Scanned photograph of Susannah Pask. Kindly provided by Fred L. Taylor. [S2450] Image of the 1901 Census for 68 Wynnstay Gardens, Kensington, London: RG13 Piece 0020 Folio 15 Page 21. Indexed incorrectly under the name of PACK. [S3] GRO Indexes to Marriages. "1907/Q2 PASK, Susannah = STANLEY, Frederick William Kensington 1a 291." [S2538] Scanned photograph of Susannah Pask with daughter Ethel. Kindly provided by Fred L. Taylor. [S5551] Image of the 1911 Census : RG14PN19613 RG78PN1177 RD416 SD1 ED10 SN55. [S4] GRO Indexes to Deaths. "1935/Q1 STANLEY, Susannah Sleaford 7a 520 aged 60." [S4999] Website UK Government Probate Search Service: STANLEY Susannah of 2 Council House Martin Lincolnshire (wife of Fredrick William Stanley) died 12 February 1935 Administration Lincoln 10 March to the said Fredrick William Stanley labourer. Effects £165 8s. 9d. [S4] GRO Indexes to Deaths. "1942/Q4 STANLEY, Frederick W. Sleaford 7a 436 aged 73." [S2438] E-mail from Fred L. Taylor to Stuart & Teresa Pask dated 13 December 2006. 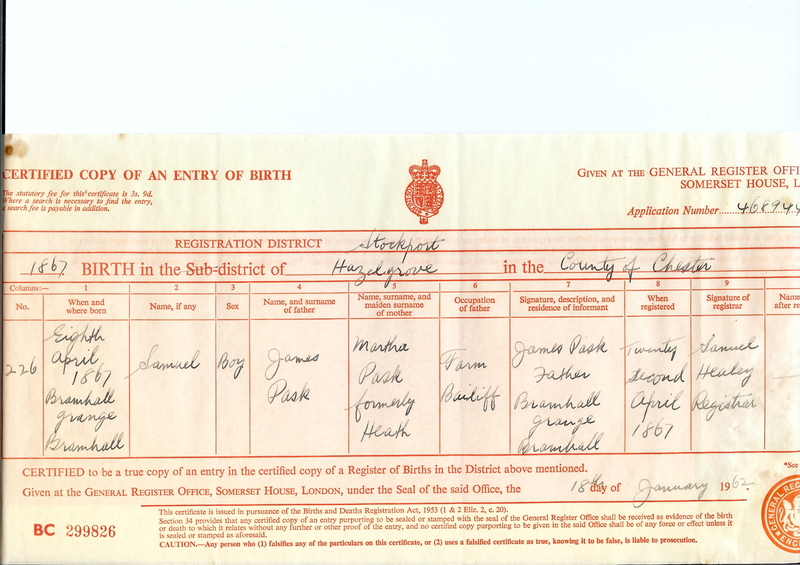 [S40] Copy of the birth certificate of Arthur Edward Pask, born 11 June 1887. Kindly provided by Margaret Blackmore. "GRO Online Index: 1875/Q4 PASK, Harriet Ann BRADSHAW Sleaford 7a 424." [S2] GRO Indexes to Births. "GRO Online Index: 1875/Q4 PASK, Harriet Ann BRADSHAW Sleaford 7a 424." 12 December 1875, Harriet Ann daughter of Edward & Eliza Paske of Blankney, a Labourer. [S3579] Scanned photograph of Harriet Ann Pask. Kindly provided by Fred L. Taylor. [S3] GRO Indexes to Marriages. "1898/Q3 PASK, Harriet = TANTON, George Chelsea 1a 778." [S5551] Image of the 1911 Census : RG14PN11983 RG78PN666 RD248 SD1 ED13 SN2. 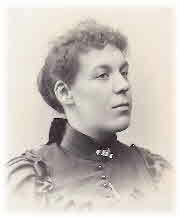 [S2539] Scanned photograph of Harriet Ann Pask. Kindly provided by Fred L. Taylor. [S5520] Website FindmyPast: British Newspapers 1710-1963: http://search.findmypast.co.uk/bna/viewarticle. [S4] GRO Indexes to Deaths. "1934/Q2 TANTON, George Bradford on Avon 5a 124 aged 60." [S4] GRO Indexes to Deaths. "1934/Q3 TANTON, Harriet A. Bath 5c 510 aged 59." [S5500] Website Parish Records Collection 1538-2005 (www.findmypast.com) : Wiltshire Memorial Inscription Index. [S2] GRO Indexes to Births. "1872/Q1 PASK, Edward Sleaford 7a 436." 10 March 1872, Edward son of Edward & Eliza Park [Pask] of Blankney, a Labourer. 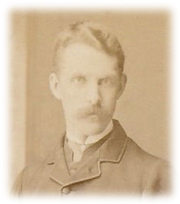 [S2536] Scanned photograph of Edward Pask. Kindly provided by Fred L. Taylor. [S5550] Image of the 1901 Census : Piece 2060 Folio 189 Page 22. [S2438] E-mail from Fred L. Taylor to Stuart & Teresa Pask dated 4 December 2006. [S3] GRO Indexes to Marriages. "1901/Q4 PASK, Edward = ARDRON, Fannie Marie Lincoln 7a 1069." 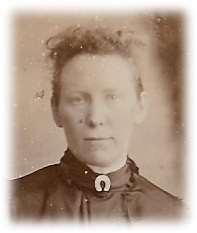 Doris Eliza daughter of Edward & Fanny Maria Pask, of 10 Palmer Street, a Labourer. [S3576] Image of the 1911 Census for 10 Palmer Street, Lincoln, Lincolnshire: RG14 Piece 19731 Schedule 184. [S387] Website Family History Online (http://www.familyhistoryonline.net: ) Edward Pask Abode Sherbrooke St, All Saints Buried 25/10/1923 Age 51 Cemetery Lincoln, St John & St Nicholas Plot D127 Extra M Type LIN CR. [S4] GRO Indexes to Deaths. "1923/Q4 PASK, Edward Lincoln 7a 535 age 51." [S4886] Digitial photograph of Edward & Fanny Maria Pask's Grave in Newport Cemetery Lincoln. Kindly provided by Paul Stainthorp. [S4] GRO Indexes to Deaths. "1955/Q1 PASK, Fanny M. Lincoln 3b 383 age 79." [S1046] Image of the 1881 Census for Prestwich, Manchester, Lancashire: RG11 Piece 4033 Folio 6 Page 5-6. 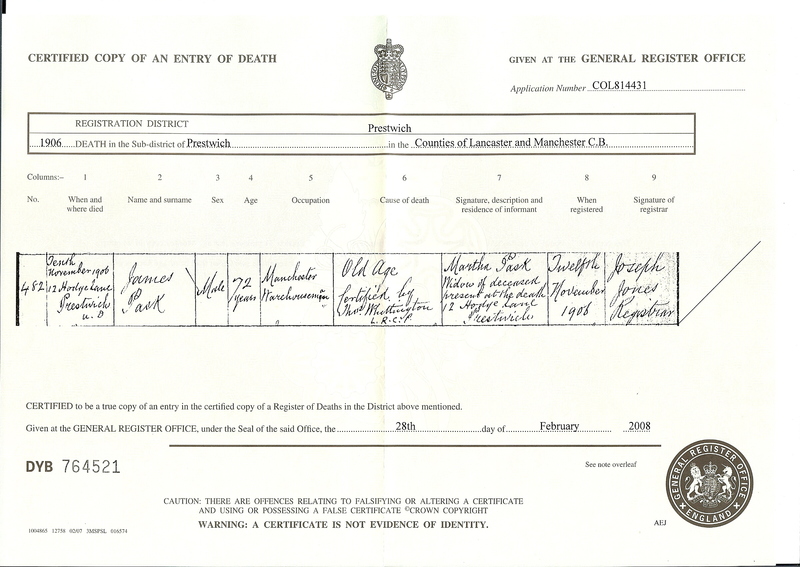 [S3202] Copy of the death certificate of James Pask, who died 10 November 1906. Kindly provided by Stephen Pask. [S194] 1881 Census for Prestwich, Lancashire. Full details upon request: FHL Film 1341963 PRO Ref RG11 Piece 4033 Folio 6 Page 5. [S1044] E-mail from Stephen Pask to Stuart & Teresa Pask dated 10 February: Transcript of marriage certificate No. 115. [S2009] Image of the 1861 Census for Yew Tree House, Woodford, Cheshire: RG09 Piece 2574 Folio 156 Page 4. Indexed incorrectly under the name of PASH. [S1044] E-mail from Stephen Pask to Stuart & Teresa Pask dated 19 February 2005. [S3203] Copy of the marriage certificate of James Pask and Martha Heath, 16 February 1865. Kindly provided by Stephen Pask. [S4180] Copy of the marriage certificate of James Pask and Martha Heath, 16 February 1865. Kindly provided by Find My Past - Cheshire Marriages c1538-1910. [S3] GRO Indexes to Marriages. 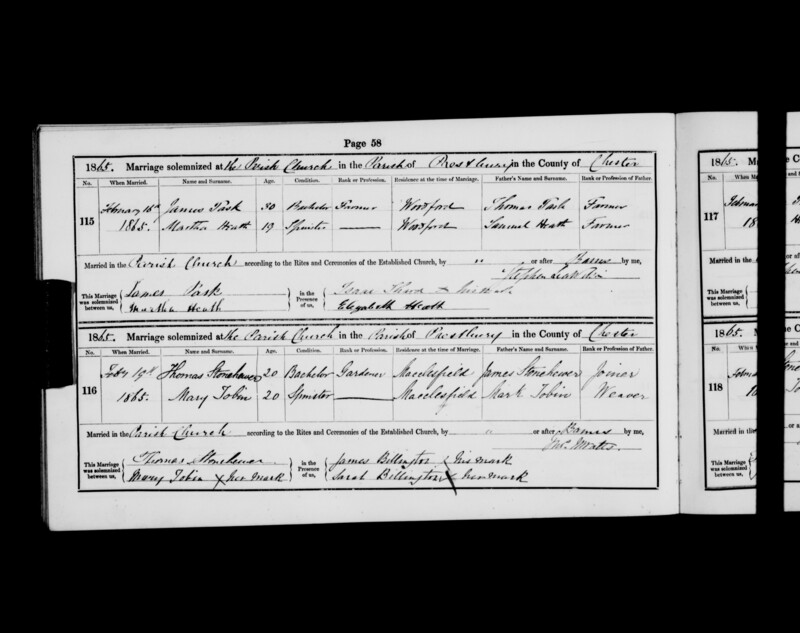 "1865/Q1 PASK, James = HEATH, Martha Macclesfield 8a 15." [S1044] E-mail from Stephen Pask to Stuart & Teresa Pask dated 8 February 2005. [S1044] E-mail from Stephen Pask to Stuart & Teresa Pask dated 10 February: Transcript of birth certificate No. 226. [S2] GRO Indexes to Births. "1867/Q2 PASK, Samuel Stockport 8a 89." [S1044] E-mail from Stephen Pask to Stuart & Teresa Pask dated 10 February: Transcript of birth certificate No. 191. 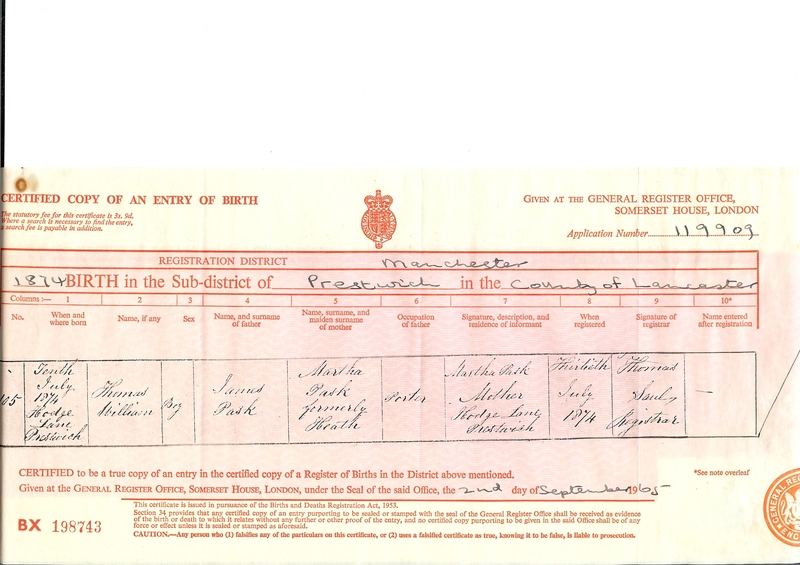 [S3205] Copy of the birth certificate of Samuel Pask, born 8 April 1867. Kindly provided by Stephen Pask. [S1045] Image of the 1871 Census for Prestwich, Manchester, Lancashire: RG10 Piece 4067 Folio 125 Page 60. [S1048] Image of the 1891 Census for Prestwich, Manchester, Lancashire: RG12 Piece 3272 Folio 33 Page 59. Indexed incorrectly under the name of PARK. [S2429] E-mail from Sharon Gill to Stuart & Teresa Pask dated 31 August 2006. 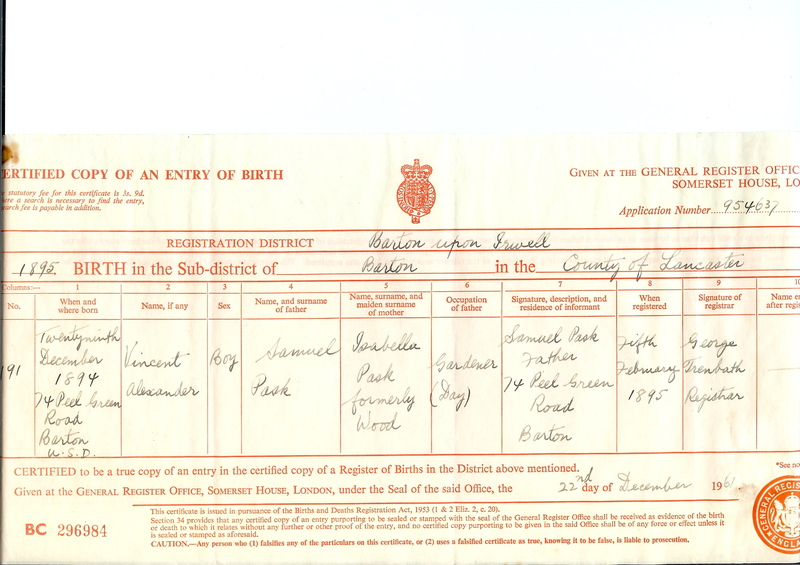 [S2428] Copy of the birth certificate of Marion Houghton Pask, born 13 September 1894. Kindly provided by Sharen Gill. [S2429] E-mail from Sharon Gill to Stuart & Teresa Pask dated 19 June 2012. [S1049] Image of the 1901 Census for Prestwich, Manchester, Lancashire: RG13 Piece 3779 Folio 8 Page 8. [S3204] Copy of the marriage certificate of Samuel Pask and Isabella Wood, 13 December 1893. Kindly provided by Stephen Pask. [S2] GRO Indexes to Births. "1868/Q4 PASK, William James Manchester 8d 351." [S2] GRO Indexes to Births. "1870/Q3 PASK, Elizabeth Manchester 8d 369." [S2] GRO Indexes to Births. "1874/Q3 PASK, Thomas William Manchester 8d 412." [S3206] Copy of the birth certificate of Thomas William Pask, born 10 July 1874. Kindly provided by Stephen Pask. [S1644] E-mail from Harry Hamilton to Stuart & Teresa Pask dated 8 November 2005. [S4179] Image of the 1911 Census for 12 Hoge Lane, Prestwich, Lancashire: RG14 Piece 24211 Schedule SN53. [S4] GRO Indexes to Deaths. "1924/Q3 PASK, Martha Prestwich 8d 317 aged 74." [S2] GRO Indexes to Births. "1866/Q1 PASK, John Macclesfield 8a 85." [S1050] Image of the 1891 Census for Worsley, Lancashire: RG12 Piece 3149 Folio 144 Page 40. [S3] GRO Indexes to Marriages. "1896/Q4 PASK, John = WARBURTON, Sarah Salford 8d 247." [S1051] Image of the 1901 Census for Cheadle, Cheshire: RG13 Piece 3301 Folio 24 Page 17. Indexed incorrectly under the name of PASH. [S4182] Image of the 1911 Census for 44 Ravenoak Road, Cheadle Hulme, Cheshire: RG14 Piece 21432 Schedule SN293. [S4] GRO Indexes to Deaths. 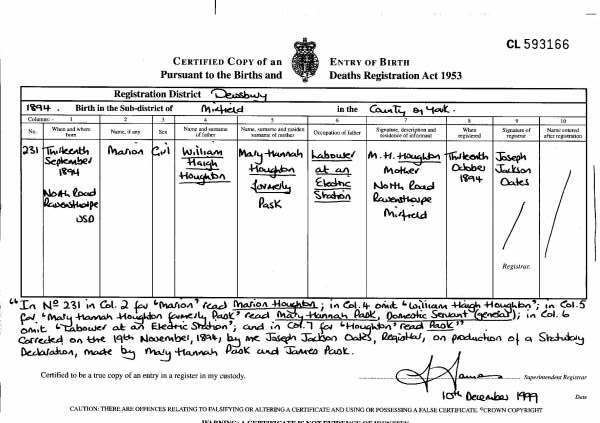 "1937/Q4 PASK, Sarah Bucklow 8a 252 age 75." [S4] GRO Indexes to Deaths. "1947/Q3 PASK, John Heywood 10c 320 age 81." [S3] GRO Indexes to Marriages. "1893/Q4 PASK, Samuel Barton I. 8c 717." [S1054] Image of the 1901 Census for Preston, Lancashire: RG13 Piece 3946 Folio 93 Page 1. [S2] GRO Indexes to Births. "1895/Q1 PASK, Vincent Alexander Barton I. 8c 732." [S3207] Copy of the birth certificate of Vincent Alexander Pask, born 29 December 1894. Kindly provided by Stephen Pask. [S4183] Image of the 1911 Census for 114 Langham Road, Blackburn, Lancashire: RG14 Piece 25033 Schedule SN210. [S4] GRO Indexes to Deaths. "1935/Q2 PASK, Samuel Middlesbro' 9d 685 age 67." [S4] GRO Indexes to Deaths. "1942/Q3 PASK, Isabella Amounderness 8e 522 age 78." "Mary Hannah Pask my great grandmother went to work as a maid in West Yorkshire and at that point we all thought it was Dewsbury she was working at, ie as that was where Marion was born, but as it transpires it was a village called Almondbury Huddersfield ... Mary Hannah Pask had not been in touch with her family in Prestwich for some time, a number of months, and the family became worried and sent her brother Noah to check on her, Noah found his sister Mary Hannah Pask living in a cottage in the grounds of the Houghton family home with a baby girl who was a few weeks old, this of course being my grandmother. We know that Mary Hannah Pask returned home to Prestwich with Marion with the help of her brother Noah, hence now the story as we knew it unfolded, we were always lead to believe that William Haigh Houghton ( Marion's father) had intended to marry Mary Hannah Pask but his family had said if he did they would cut him off from the family and all inheritance, and at this point Mary Hannah Pask always said she would never allow that to happen, we were told that William Haigh Houghton was well to do maybe a Lord or son of a Lord. My grandmother was told she was paid for until she was 16 years old. I grew up knowing the story and listening to my Mother talk about how Polly ( Mary Hannah Pask nickname) would talk about the Houghtons and who did his Lordship think he was sort of thing! I think my Great Grandmother was directing her hurt and anger towards the whole Houghton family she clearly thought he would marry her which is most evident if you take a look at the birth certificate of which you will find a copy on this site, and although they were a wealthy family they did not carry any titles, William Haigh Houghton and his brother Herbert did set up a charity for the Almondbury poor as the family were wool merchants in the area and they built 13 alm houses know as the Houghton Alm houses in Almondbury Huddersfield which is still being run today, the Houghton name died out alas as not any of William Haigh Houghton family had any family and he died without issue. Mary Hannah Pask went on to marry James Williams when my Grandmother was around 9yrs old and James Williams cared for her like a daughter, a truly caring man, they went on to have 3 children, a very close loving family. We made a promise to my Grandmother that we would find the Father she never knew, an all to common issue of those times, I'm still trying to locate some photographs of The Houghton Family which is proving most difficult even though William Haigh Houghton was a keen photographer. [S2] GRO Indexes to Births. "1872/Q3 PASK, Mary Hannah Manchester 8d 394." [S1055] Image of the 1901 Census for Prestwich, Manchester, Lancashire: RG13 Piece 3779 Folio 6 Page 3. [S2429] E-mail from Sharon Gill to Stuart & Teresa Pask dated 9 December 2006. [S3] GRO Indexes to Marriages. 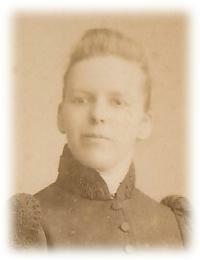 "1902/Q2 PASK, Mary Hannah = WILLIAMS, James Prestwich 8d 581." [S4181] Image of the 1911 Census for 9 Simister Lane, Prestwich, Lancashire: RG14 Piece 24211 Schedule SN142.